Here is the bike which has featured pretty exclusively in my posts over the past month or so. Finally put the engine back in today, a milestone! It has already been a labour of love in more than one sense. I'm doing it for an old friend who wants the bike to look as new as possible, which has been a challenge for me, accustomed as I am to just "fixing" things. 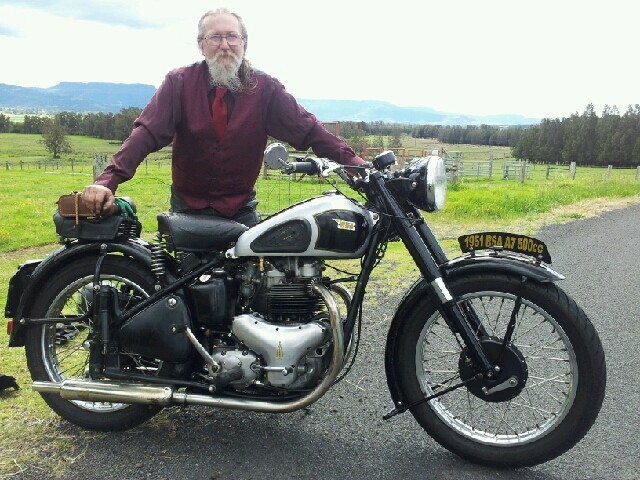 Josef has had the bike for more than 40 years and I remember riding it when we lived there (near Munich). In recent years it has been laid up waiting to be resurrected, and now, we hope, its time has come. Forum members have already helped with spare casings, gearbox internals and lots of good advice. Weld repairs already done on the frame. tanks, primary chaincase (lumiweld, worked very well indeed). Absolutely every individual part has been stripped and inspected. New pistons, valves, springs etc as well as new bottom end bearings throughout and in gearbox. Frame already powder coated, sheet metalwork will be painted. We have probably already spent far more than the bike is worth. But this is going to be a good bike. Thanks yes I can see how that can happen. I’ll wedge it out as you suggest. At least I didn’t forget to put the cam in. An old mate of mine was building an Ajay twin and put the cam followers in upside down. Bonkers but it did run for a short while. That was 50 years ago. It’s one of the few stories that can still irritate him- especially when told in front of a young audience. Tank just back from the platers. The dents in front of the filler cap are going to restrict the paint plan too much, so I am getting another tank from Greybeard which will hopefully be better. But I'd like to use this one if I can. Does anyone have the precise paint plan for this model and year? I am going to do it in the black livery. Got the camwheel on but it was a struggle. I may have to remove it and refit with a new key, the old key slides in the key way allowing it to be pushed against the flange of the t/S bush. It has roughed the surface up a bit. However it (the key) is in the right place now so maybe just leave well alone what do you think? It took me a whole evening to do that. Good job John warned you about that one. If the pinion is all the way home and the key is where it should be , it's good to go. The key can't move once the pinion is on. There was a post on the paint lines, I'll try to find it. I’d say leave well alone, I had the same issue and ground a little bit off one end of the key off to fix it. If the key slides I guess it’s because it does not project high enough to hit the top of the groove in the gear? Found it. Hope it helps. I remember back to my first experience fitting the cam pinion (1981). The key was tight in the pinion slot so the pinion rocked it up at the back and into the bush. End result I had to replace the bush. The problem arises when the key is sloppy in the shaft, tight in the pinion and the pinion is a snug fit on the shaft. Don't tell anyone but I put a little superglue to hold the key in the shaft, a tiny lead in on the pinion slot and warm the pinion in hot water.